Avatar (2009) is a flawed, but gorgeous film with heart that revolutionizes cinema as we know it. When my wife and I went to see the movies last Friday we ordered our tickets online, dropped our son at the babysitter and raced to the local Harkins cinema. We were convinced we were going to be in the front row, because everyone knows you don't go to a big movie less than an hour before show time. At T minus 45 minutes we nervously ventured into the theater...to find it virtually empty. Later, we found out the reason the place was empty. Avatar is about a paralyzed war veteran, played by Sam Worthington, who volunteers to take his brother's place driving an "avatar," a biological robot, on a distant alien moon called "Pandora." The moon is inhabited by a ten-foot-tall hostile blue alien race, called the Na'vi, which is stopping them from mining "Unobtainium." He joins Sigourney Weaver's team of researchers trying to broker a peace treaty with the natives. When he gets adopted by the tribe, he falls in love with the princess Neytiri, played by Zoe Saldana, and joins them in fighting the corporation's attempts at forced re-location during some knuckle-biting action scenes. 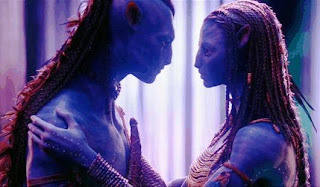 The film's plot is far from original, by taking Native American themes and setting them on another world, but it's the love story between Jake and Neytiri that holds the film together. Worthington and Saldana give many subtle movements and gestures that bring the characters to life and Cameron manages to find the universal themes in his story in a way that's entertaining and moving. By the way, the reason the theater was empty was because everyone was in the 3-D showing. The bulk of ticket sales this past weekend are from the stereoscopic film viewings, 58% at last count, and we were behind the curve. I've been a huge skeptic of 3-D films, but when we went again this last Saturday I was shocked at how natural it was to watch a film in three dimensions. While nothing jumped out of the screen to demand my attention, the subtle depth of field made the experience extremely enjoyable. Already studios are scrambling to revamp upcoming films in 3-D and I couldn't be happier. Overall the movie, with its themes of environmentalism, is engaging, powerful and visually stunning. UPDATE: Shout-out to "The Sci-Fi Gene" for coming up with a title I wish I'd thought of " Flight of the Na'avigator [Review: Avatar]. We'd love to hear what you think of Avatar and 3-D movies in general? Let us know in the comments! Wait a minute...James Cameron made a good movie? I thought he nuked the fridge with "Titanic." Maybe I will see it...but I can never forgive him for that 3-hour dump. [p]Augustine and several experts too as Trudy, Michelle Rodriguez(Fast and Furious) a gun ship pilot steal her gun ship and sign [url=http://www.tiffanyoutletinuk.co.uk]cheap tiffany jewellery[/url] up for the Na'vi . The company was growing quickly and faced challenges assuring the flow of top quality raw materials . It is very wonderful! Don you heartbeat?